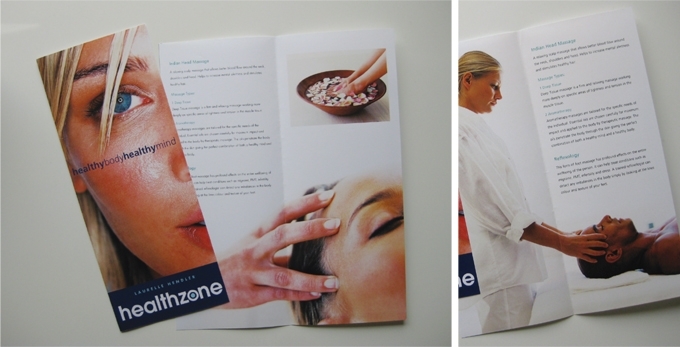 Healthzone provides an exceptional range of health and beauty treatments designed to promote feelings of well being and general good health. They offer a holistic experience which means the therapies do not just have physical benefits – they help the mental, emotional and the spiritual well being of a person. The ‘o’ in the logo indicates the zone part of the name and reflects a truly rounded experience. We chose ‘healthy body healthy mind’ to re-inforce the message of a healthy physical and mental experience. Lots of clean, white space and fresh photography sells the ultimate experience of well-being.